I am a huge fan of the Winter Olympics, so when I was back in FL finishing up my last semester of library school in February of 2010, I would sit in front of the TV, writing papers while admiring the mad skills of snowboarder Shaun White and the pure heat of speed skater Apolo Anton Ohno. However, the ladies really stepped up on the ski slopes, with Lindsey Vonn and Julia Mancuso each getting medals too, which made me wonder if I could ever have a shot at the Olympics on skis. Was it really that hard? One year later, and I am getting my chance at Whistler Mountain. Braving the exact course the women’s ski team took, I carefully slide down Wild Card, then cut across Jimmy’s Joker to Franz’s Run, where I proceed to fall for the first time all day. Oh well, Lindsey and Julie fell too but they got back up and won medals! Thankfully, the Whistler Public Library was nearby so I could conduct some additional research and hopefully pick up some tips before trying to compete in 2014. Then again, getting a library job would be like winning the gold medal, with a lot less injuries…Enjoy the video!!!! 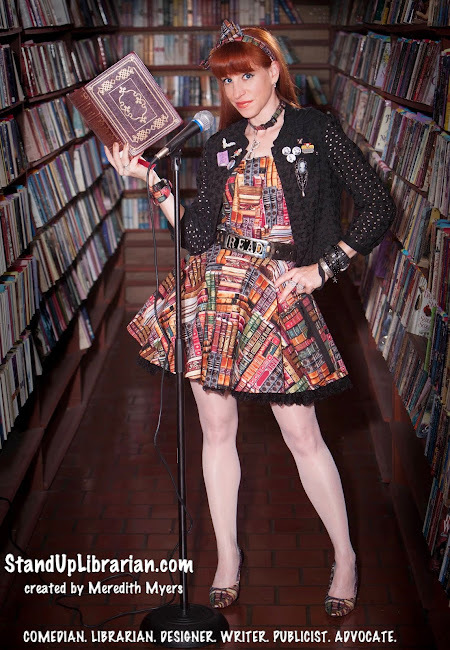 Today we interviewed Meredith of Stand-Up Librarian, a blog that offers an inside look into the life of a librarian. Whether you’re a librarian yourself or just looking to find out more about libraries, Meredith offers us an insider’s view into what books are popular right now and what eBooks mean for our future. What are the popular book genres that are frequently being checked out at the library? I think popularity varies on the type and location of the library. Last year when I was back in Florida, finishing my Masters degree, I was working at a public library in a small beach town, where the majority of patrons were retirees or snowbirds in town for the winter season. The most popular genre by far was Romance. A big favorite for teens in any library is Manga and Fantasy. Do you have Bleach? Twilight? Harry Potter? Then again, just as many adults are checking out those last two titles for themselves! As a librarian, do people ever recommend books to you? What type of books do you enjoy? People always love to recommend books to fellow book lovers, or anybody that will listen. When I work the reference desk, I can’t help but to develop a dialogue with patrons who have a real excitement about reading and sharing their favorite titles. Even as a librarian, I’ve never pretended to be an expert on the entire library collection, so I am always genuinely interested in hearing what others find interesting. I never would have gotten hooked on Charlaine Harris’ Sookie Stackhouse series if patrons hadn’t kept requesting them all the time and insisting I read them! For pleasure reading, my favorite genre would probably be Historical Thrillers, which is a sub-genre formed from combining Historical Fiction with Thrillers. Or maybe it is Historical Adventure Thrillers, who can keep up with genres these days? Steve Berry is my favorite in this area, since I crave adventure, travel, and history. Berry is great with this, plus I like how at the end of each book, he provides the reader with an explanation of where he fictionalized the history in the story. I wish more films did this. I also live for the latest by Lincoln Child and Douglas Preston, who write what is called Techno-Thrillers, and often feature the exotic and eccentric Agent Aloysius X. L. Pendergast, investigating mysterious museum artifacts. If you can’t make it to your local Natural History Museum, pick up The Relic or Cabinet of Curiosities and I promise it will feel like you are there! In the Inspirational genre, my favorite book of all time is The Alchemist, by Paulo Coelho, which I have in several versions: audio on my iPod, electronic copy on my Kindle, paperback with highlighted pages and notes, and the graphic novel, released last year. I am also known to give it as a gift to friends. I think we all need to be reminded that the journey to attaining the dream is sometimes more important than the dream itself! As eBook sales continue to grow, how do you feel about the future of libraries? I’ll be the first to admit that I have a Kindle and a subscription to Netflix, but I mostly use my Kindle when I travel, and my Netflix for requesting hard to find films. Having these modern conveniences, however, doesn’t stop me from going to the public library to check out books or borrow DVDs for free! I think the library has a big future, especially if people continue to use it. With technological advances comes information overload, and the only people to help you weed through it, are information specialists, also called librarians. For that reason alone, libraries and librarians aren’t going anywhere. Besides, isn’t there something wonderful about physically being at the library, walking through the stacks, randomly selecting items that catch your interest, whether it be from the display table out front, or by having an interaction with another patron who insists you pick up her favorite book? Just last week, I was at my local public library, with no real reason other than I felt frustrated about my job search, and wanting inspiration from the numerous opportunities that fill the shelves. The library is the one place where dreams always come true, since it is a place where knowledge and information is free to everyone. Thanks to Goldie Hawn, Jane Fonda, and Carol Burnett, I left that library, not only with their books in my arms, but also with the reassurance that everyone encounters obstacles, I’m just grateful the library is there offering us solutions and an escape to laugh about it. I was a huge fan of Snooki’s A Shore Thing and Barbra Streisand’s My Passion For Design was just beautiful, but should have been called My Passion For…Overspending. Seriously though, I just finished reading Possessed: The Life of Joan Crawford by Donald Spoto, which I quite enjoyed, as it offered the perspective of Joan as a hardworking actress dedicated to her craft, as opposed to just a psychotic monster, showcased so famously in “Mommie Dearest.” I think teens will totally enjoy How They Croaked: The Awful Ends of the Awfully Famous by Georgia Bragg, illustrated by Kevin O’Malley, released just last month, featuring the gross and gory details of how historical figures like Mozart, Napoleon, and our own George Washington, experienced painful and disgusting deaths, mostly because of the idiotic medicine practices of the time. A great picture book for any adult trying to get over a bad breakup is Why He’s My Ex by Krishna Devine and Jessica G. Hill, where dolls are dressed up and put them in real life dating situations that took a turn for the worse. A book sure to make anybody actually feel happy about sitting at home on a Friday night! Last, and surely not least, is Marilyn Johnson’s This Book Is Overdue! : How Librarians and Cyberians Can Save Us All, a book which speaks to the importance of librarians and their necessity in the world. I not only enjoyed reading this on the eve of my graduation last year, after meeting Marilyn at a library conference, but I’ve also chosen to dedicate my life to being one of libraries’ advocates. I developed my blog a few weeks later. Meredith Myers recently graduated with her Masters degree in Library and Information Sciences from the University of South Florida. Her mission with StandUpLibrarian.com is to educate, while entertaining people about libraries and their necessity. She has been performing stand-up comedy since 2002, after checking out a comedy book from her local library. Written by admin at The Gatekeepers Post. "The Road Not Taken": Celebrate National Poetry Month This April! Here I am “ages and ages hence” on something called the Internet, telling you weekly stories that the path I have taken in life has been filled with the ups and downs of career confusion and job dysfunction, regardless of my ambition, talent, and passion. Being an individualist and artist, I probably chose the road “less traveled by” (no wonder the Los Angeles traffic is so bad – we are all on the same road!) I’m still deciding whether it “has made all the difference” (I’m only in my thirties, people, I hope my life isn’t over yet!) Obviously, the poem speaks to the idea of looking at one’s life with regret or satisfaction, which I think everybody does at some point, but that is a whole other blog post. At the end of the day, I am just thankful to Frost and the millions of talented poets out there, who in a few choice words are able to develop a story with heartfelt emotion and numerous interpretations, to inspire generations of people for decades. Topics to search at your library: poetry, poets, how to write poetry, tons of books in the 811 section!